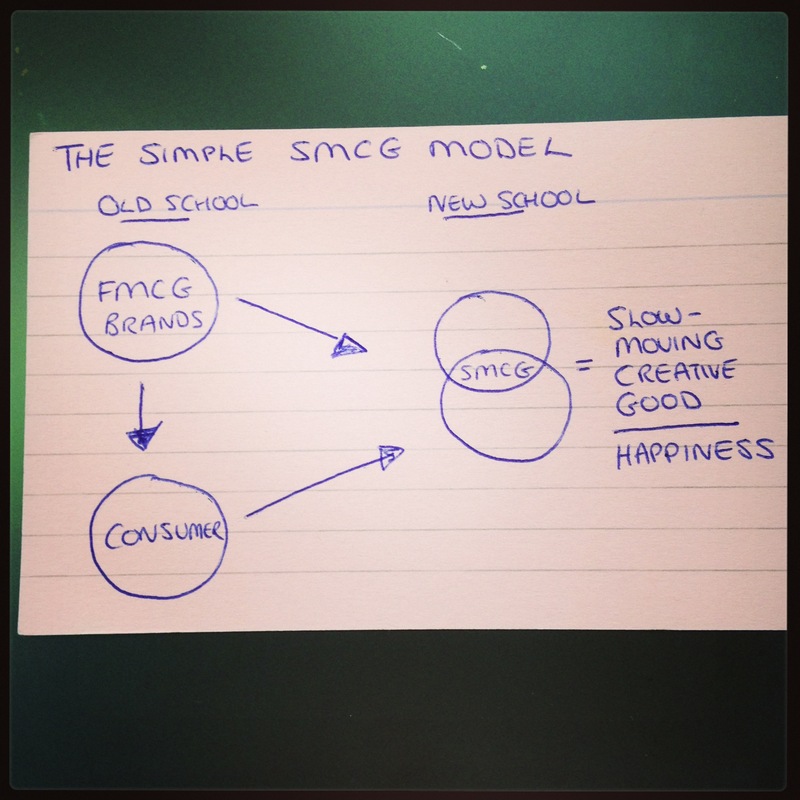 We live in a world dominated by FMCG (fast-moving consumer goods) brands. It’s a fast-moving world. We are all consumers. And it’s all about the goods — the things we buy. But there are signs of change. I believe that we are shifting to an SMCG world. One which is about Slow-Moving Creative Good. And seeing these signs of change as inter-related will help to consolidate and accelerate the shift. Slow — There is Slow Food,where we think about where the food comes from, and enjoy the process of how it is made, not just the consumption. There is Slow Fashion or Slow Style, the counter to Fast Fashion, clothes that are made to be worn again and again, and made in conditions that we do not need to be ashamed of, from raw materials that are recycled or produced in less environmentally-harmful ways. There is a general Slowing-Down, with more people turning to activities like meditation, yoga, walking and cycling as an antidote to the fastness of life around them. Moving — Originally, I thought of this as part of Slow-Moving, and it works like that. But, whilst stirring some soup,it came to me that moving deserves to stand alone as well. It is about that which moves us, that which connects with us on an emotional level. It is the being in the present that enables us to be moved. I think that this was front of mind because of this morning reading Laurie Anderson’s obituary to her husband, Lou Reed. In it she writes of how he spent his last week “being happy and dazzled by the beauty and power and softness of nature”. It is about the movement that comes from inside when we are still, when we stop moving. Creative — We are not just consumers anymore. We create online all the time. Young people are using their creativity building apps. MakerFaires are pulling in the punters. We’re collaborating in our consumption. More people are growing their own vegetables and getting creative in the kitchen. We are the people formerly known as the audience. We are no longer an audience of consumers. We are creators, I firmly believe this innate in all us and needs to be expressed if we are to be fulfilled. And we want to be part of the brands that serve us. Good — It is not about the goods, the things that we buy. It is about the good that is generated and shared from what we do — whether it is the things we buy, the things we make, the love that we spread. It is a shift from physical goods to the network of good. My Po-Zu shoes shown in the picture above are an example of good, with every aspect of creation carefully thought through,from the coconut husk foot mattress to vegetable tanned leather, they are slow-made with love, and they encourage me to slow down and walk (Po-Zu means ‘pause’ in Japanese. Towards a new model, where we are not separate consumers. I make some generalisations, and there is a long way to go until we are living a SMCG life. I know myself the journey that I need to go on. But the point is that the seeds are there, and growing. We have the research to show that more money does not make us happy once our basic needs are met. But qualities of slow, moving, creativity and good do. What does this mean for you? What topics would you like me to see explore further within this, or who would like me to speak to? Do you think that there is more of a need to focus on what this means for brands, or for people, or both? 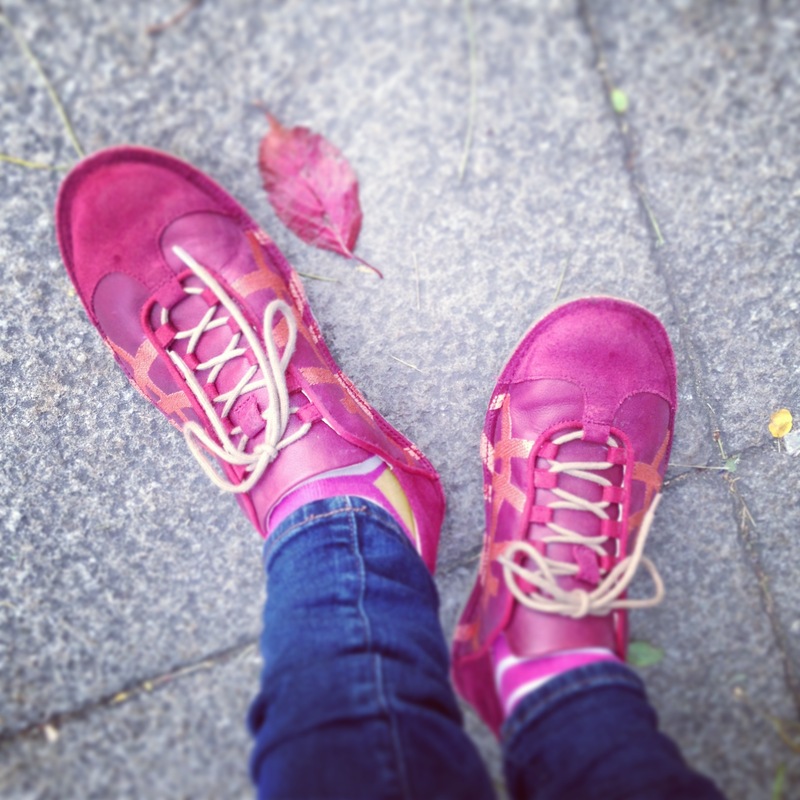 This entry was posted in sustainability and tagged consumers, creativity, good, slow on November 1, 2013 by Olivia.